This is Classic Boat person of the year Giacomo de Stefano taking delivery of Jennie of Paglesham, which he intends to restore to cruising condition at Faversham during the later part of next summer after he has completed his Man on the Snow project. The fun ‘yacht in a bottle’ was made by previous owner Rhodri Williams during his time in the Navy, in fact during the first Iraq War. Giacomo tells me that Jennie is soft in only a few areas, and I hope it’s true because he tells me that it’s all my fault that he bought her following a post I published on this website a while back. 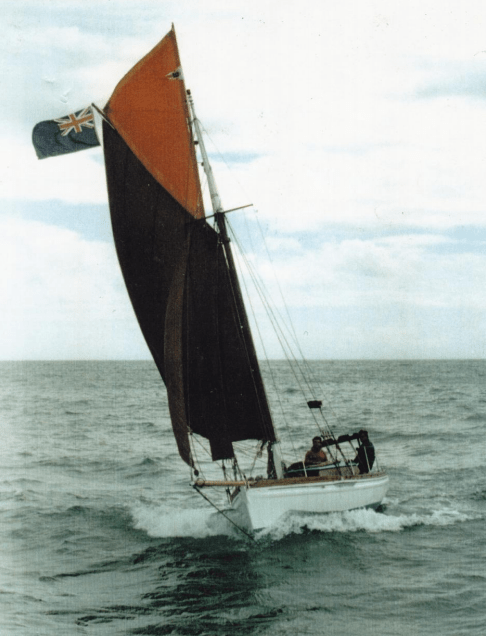 Jennie of Paglesham was built by Frank Shuttlewood in 1946/7 from the bones of his grandfather’s 1885 clinker-built boat Jennie. An article about Jennie by the late Maurice Griffiths appeared in YMApril 1948. See the link above for more information. Man on the Snow is an expedition to travel from Oslo in Sweden to Nordkapp at the far North of Norway by sustainable means, and follows the earlier Man on the River in which Giacomo, with the help of friends, built an Iain Oughtred-designed sailing dinghy and rowed and sailed all the way from London to Istanbul, again using sustainable means so far as possible, which of course meant he had no engine. I think we should all wish him luck with both endeavours! 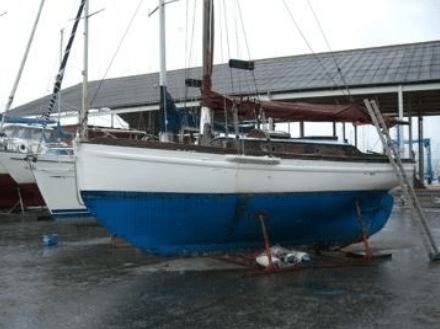 I’ve posted about this boat before – but this boat is now offered free to a good home. I do hope she finds one soon! Jennie of Paglesham was built by Frank Shuttlewood in 1946/7 from the bones of his grandfather’s 1885 clinker-built boat Jennie. An article about Jennie by the late Maurice Griffiths appeared in YM April 1948 (see links below). She is a gaff-rigged cutter measuring 24ft 6in by 8ft 3in by 4ft, she comes fully equipped including new standing rigging. Jennie of Paglesham is currently ashore at Gosport where viewing may be arranged. Contact Rhodri Williams by email at rhodriyorathwilliams@btinternet.com for details. My thanks to Fowey boat builder Marcus Lewis for passing this enquiry on.